Now this is the type of truck that I need right here. Gives you the feel of being at war while not being, you know, at war. I didn't hit the lotto so it's outta my price range. It’s no secret that Austrian-American actor Arnold Schwarzenegger has an eye for brawnier forms of transport, including tanks and military grade Hummer H1s. Having acquired just about every notable off-road vehicle throughout his time as one of Hollywood’s defining stars, Schwarzenegger is selling his Mercedes-Benz Unimog U1300 SE 6.4. 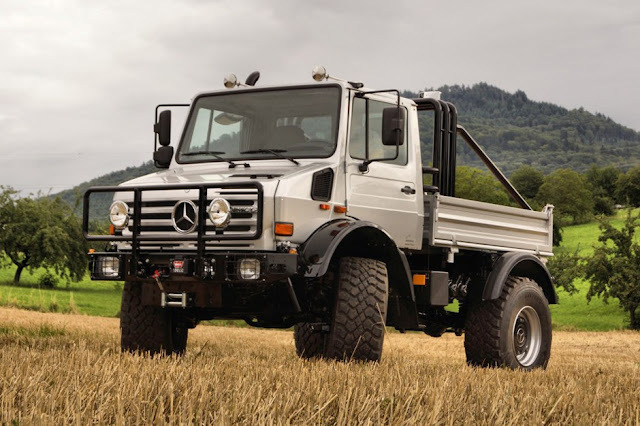 Available with full documentation and photographic evidence of the man himself taking delivery, the Unimog features a signed dashboard, 1,865.5 miles on the odometer and a hefty price tag of $350,980 USD. As well as a plethora of custom made features, the vehicle features a 6.4 liter turbocharged diesel I6 engine, massive Michelin XZL 445/65R22.5 tires and a Blaupunkt audio system.